Travelling back down through Johnstone Strait. 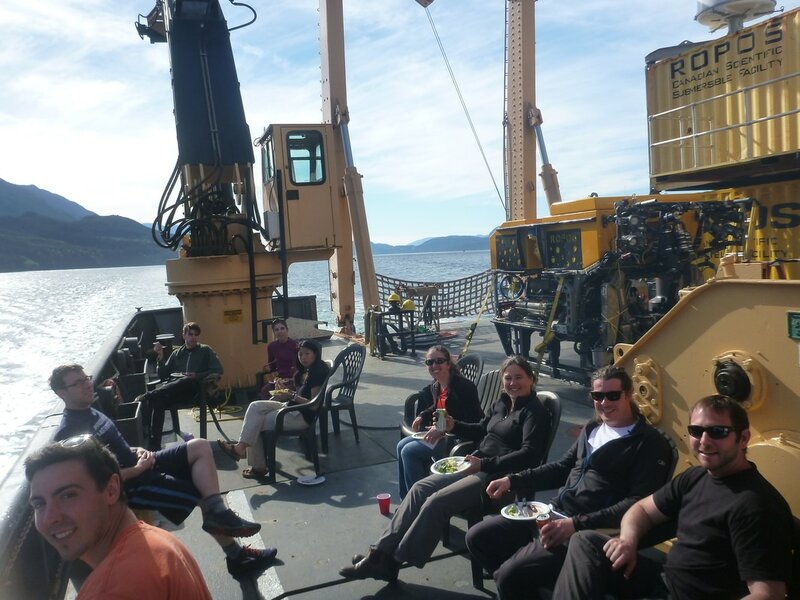 A ship's BBQ dinner makes a happy science crew after an extremely successful 9 days of non-stop diving. The ship’s lab is packed up so quickly, there is a feeling of exhaustion, contentedness and sadness that the trip is over. A bush of 'flutes'! We have finally come to understand how this strange sponge works. It seems to start off as a small sheet, a wafer, that folds into a tube and is attached at the base at one spot. Another flute forms and is fused to the last. 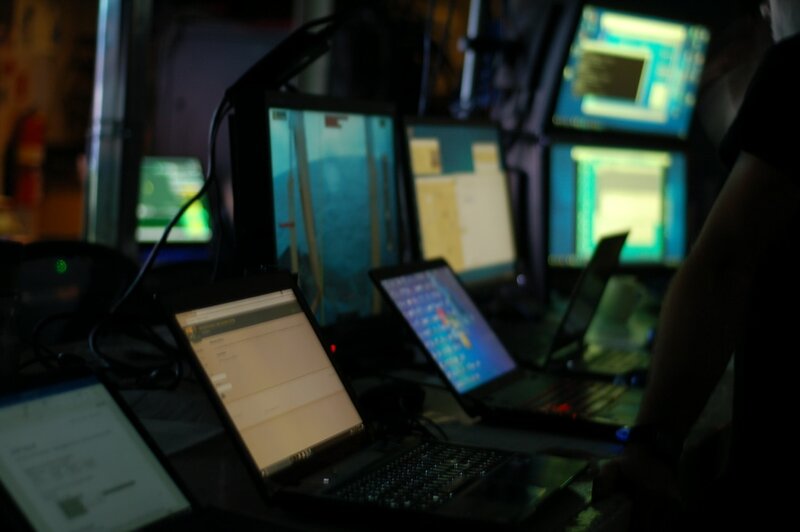 ​There are certain occupations that make you wonder how someone started doing what they do, and piloting an underwater science robot is certainly one of them. 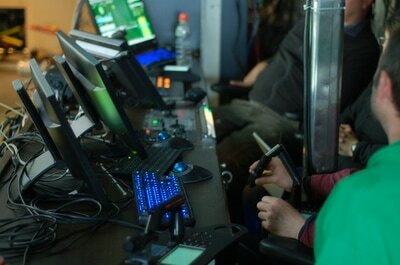 A job not many children dream of, but one that is likely closer to being an astronaut than any other terrestrial job. 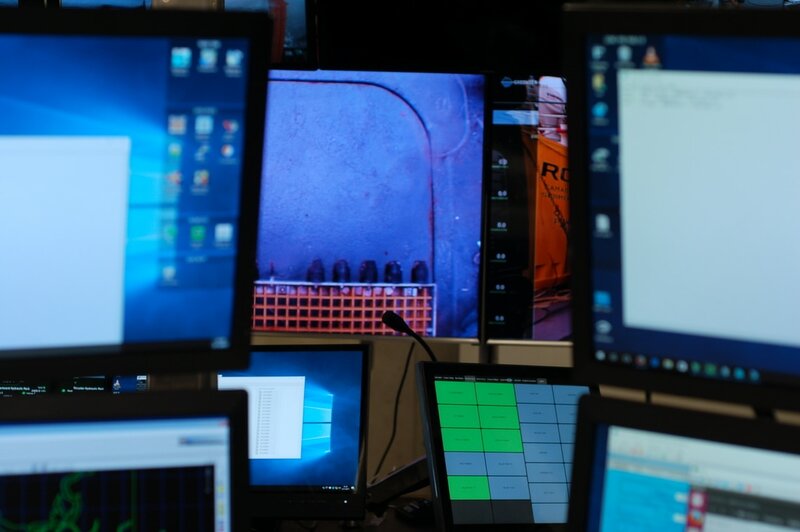 Over the course of our cruise I’ve had the opportunity to chat with several of the ROPOS* crew about what it takes to be a submersible operator. ​The original 1985 ROPOS was manufactured in Port Coquitlam (British Columbia), but several generations and decades of technological advancement later it’s an entirely new state-of-the-art machine. 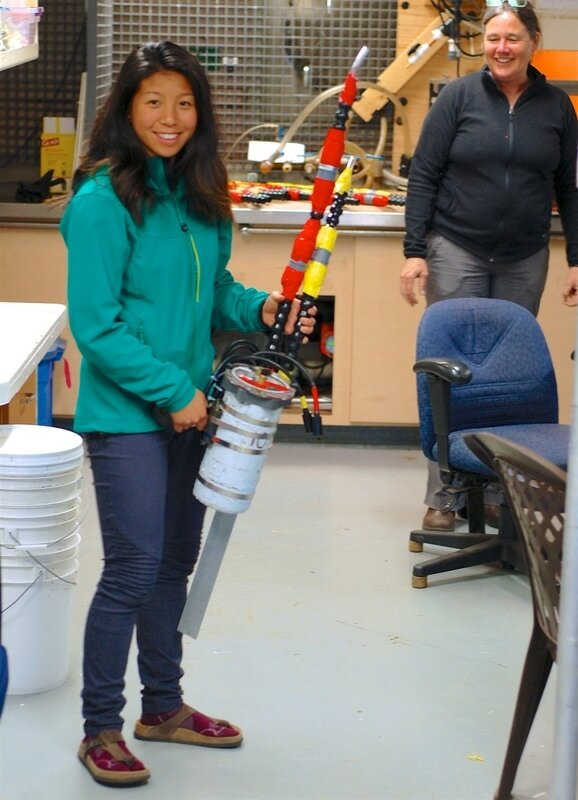 The three-ton robot is equipped with over $200K of cameras, CTD (Conductivity Temperature Depth sensor), Sonar, a suction sampler, top-notch navigation system, and two custom built titanium arms that are so versatile they can fit a 1cm diameter probe into a 2cm diameter sponge opening – one of the hardest things the ROPOS crew do. ​Operating the $2.3M robot thousands of meters below sea level is by no means a trivial task. Although most of the crew are educated as engineers, this job can’t be trained for and requires adaptability and quick thinking. Being a pilot is not for anyone who likes to do things “by-the-book”, says pilot Peter Lockhart. Peter Lockhart going through pre-dive checks. ​When Luke Girard started with ROPOS he got thrown right in the deep end (literally), and had to figure how to work on the fly. It takes impeccable spacial acuity, a cool head, and, perhaps most importantly, some strong sea legs. Keith Tamburri, the lead operator, said that sometimes you have no choice but to work in rough weather, so losing time to seasickness is not an option. Early in his career Keith recalls being caught in a storm with 24m waves; he described it as two sleepless days of hell when he genuinely feared for his life. Keith Tamburri walking Peter Lockhart and Luke Girard through needed adjustments. ​So, if this job doesn’t have an “entry level”, how does someone start out? Keith first started working with submersibles at 15 and was part of the team that delivered and tested the original ROPOS. After a stint in entrepreneurship he got his degree in robotics from BCIT in 1989, and started working with ROPOS two years later. 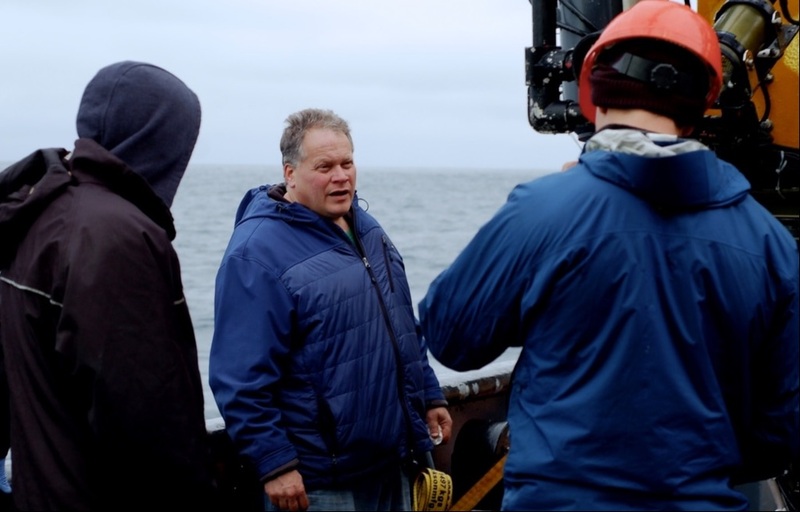 He chose to work with ROPOS specifically because he loved marine science (and even took two years in college; however, was “asked to take a break because he was having too much fun”). Keith says he loves the technical challenges that come with the job, and working with educated people who do interesting projects. ROPOS being deployed in the water. ​On this job, you certainly get to see things not many people get to. Keith fondly recalled diving with a team of anthropologists exploring ship wrecks from 2000BC, and on the same dive seeing fibreglass boats from the 80s: a perfect juxtaposition of seafaring through the years. Peter said his favourite part is exploring the unknown and described awe-inspiring hydrothermal vents abundant with unusual creatures that adapted to an extreme way of life. 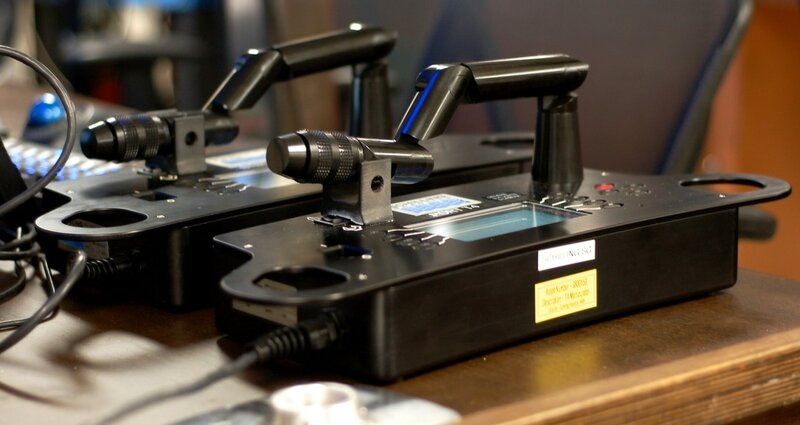 Joysticks used for manipulating the ROPOS arms. 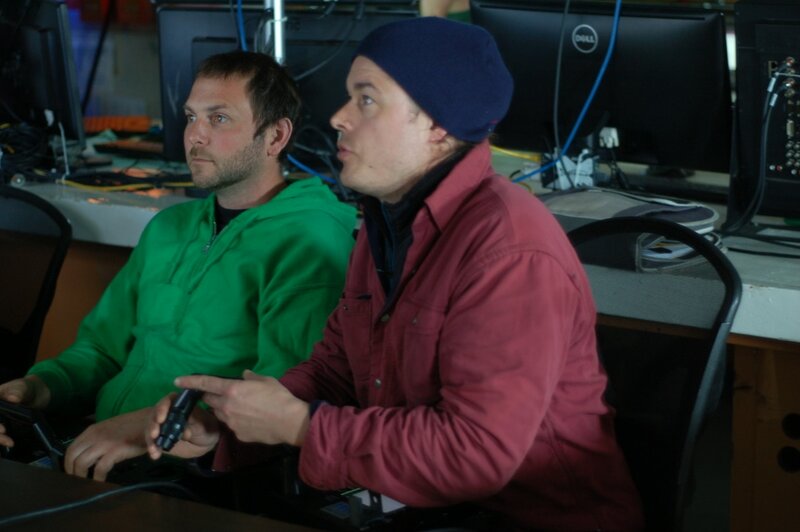 ​Consistent with being adventurous, this job is anything but a stable nine-to-five. 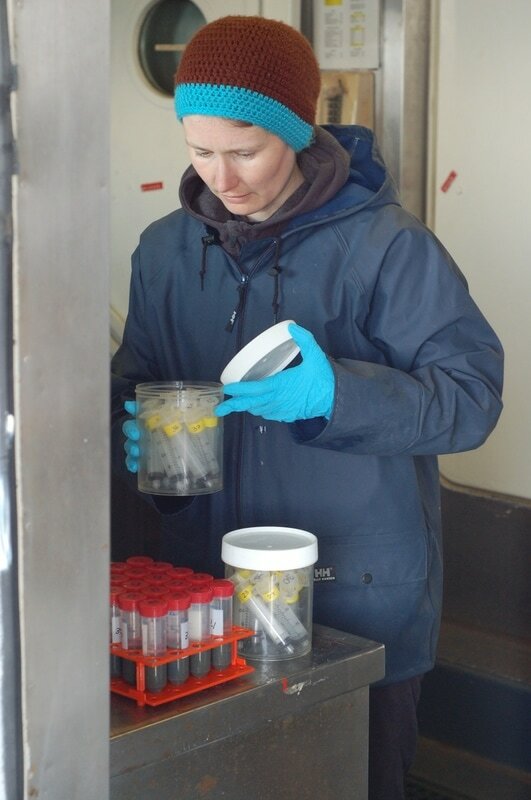 In the past, ROPOS operations have taken place primarily in the summer when the weather is kinder; however recently the team started working winters in the southern hemisphere. The stretches of work mean leaving your family for as long as eight weeks, and that can be one of the hardest parts, said Peter. 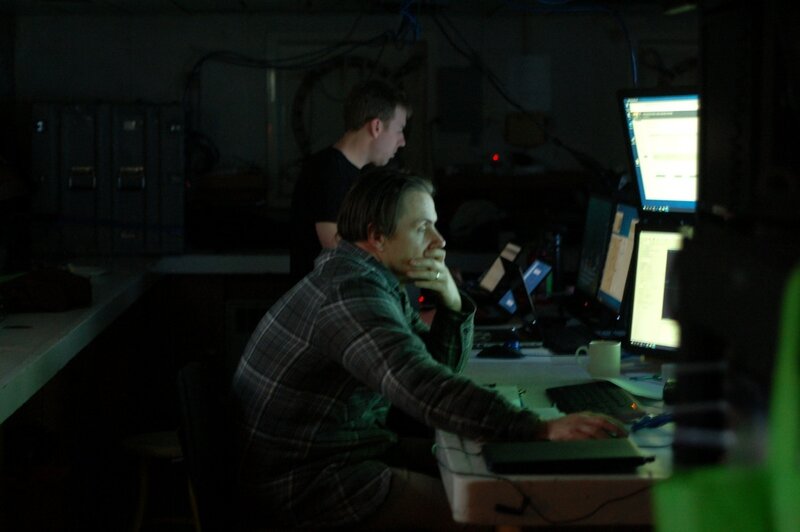 When not at sea, the operators are in Victoria, British Columbia fixing and modifying the ROV. ​Because ROPOS is a registered non-for-profit all the funds are reinvested in the company, which allows them to keep up with technological advances. In the future both Peter and Keith see ROPOS acquiring a second robot, and expanding into Autonomous Underwater Vehicles (AUVs). ​The advancement of underwater technologies is important for executing more delicate experiments and exploring the ocean in more detail. 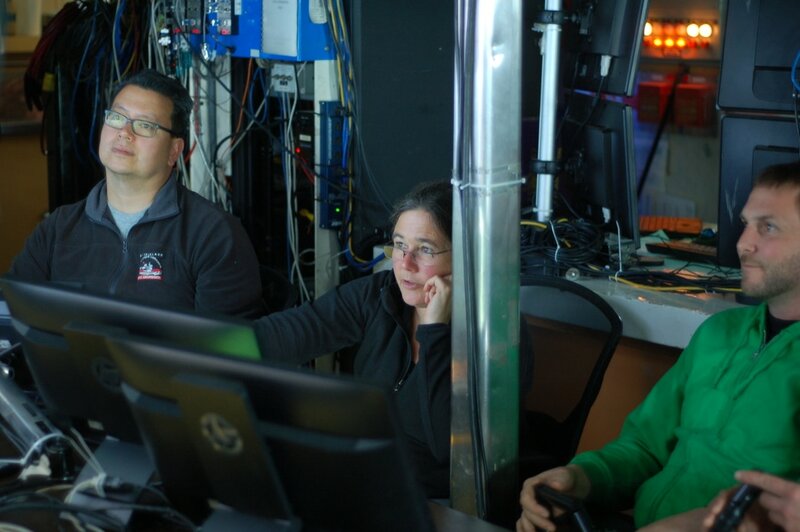 We’re very fortunate to be able to use ROPOS for researching the sponge reefs and are excited to see what the ROV future holds. 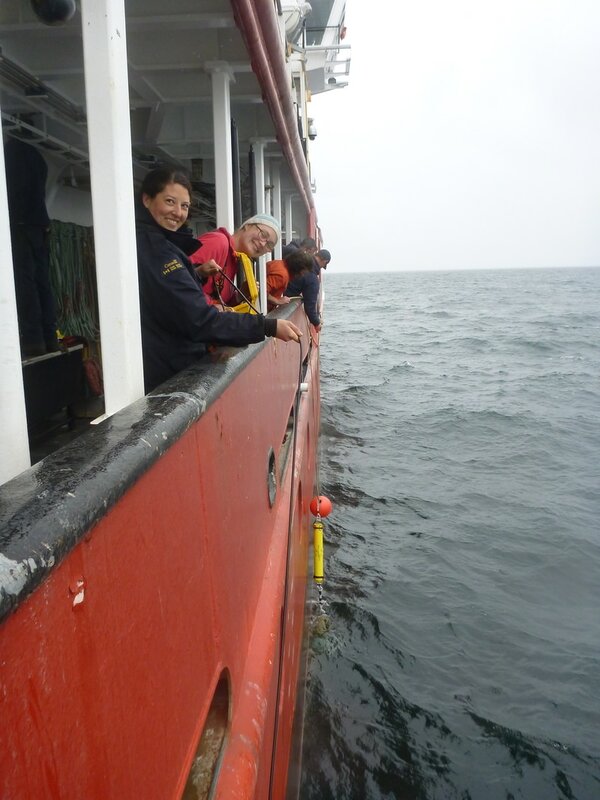 Deployed the hydrophones! (and got them back - even better): what does a reef sound like? Read our blog from 2015 about the life in the control room. 1. The weather was good enough for us to be able to dive every planned dive so far. 2. We were able to get a great calibration of one of our thermistors against the Vector on our first try. 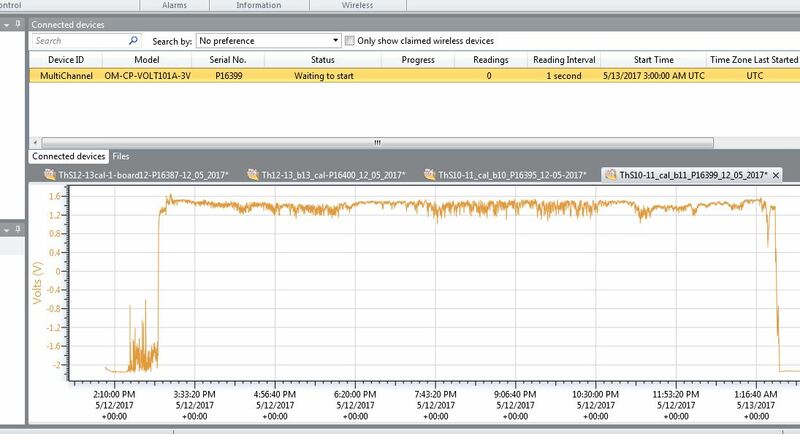 Just look a these calibration graphs! ​3. None of the housings for our instruments flooded. 4. We got the thermistor and oxygen sensors right in the osculum. 5. 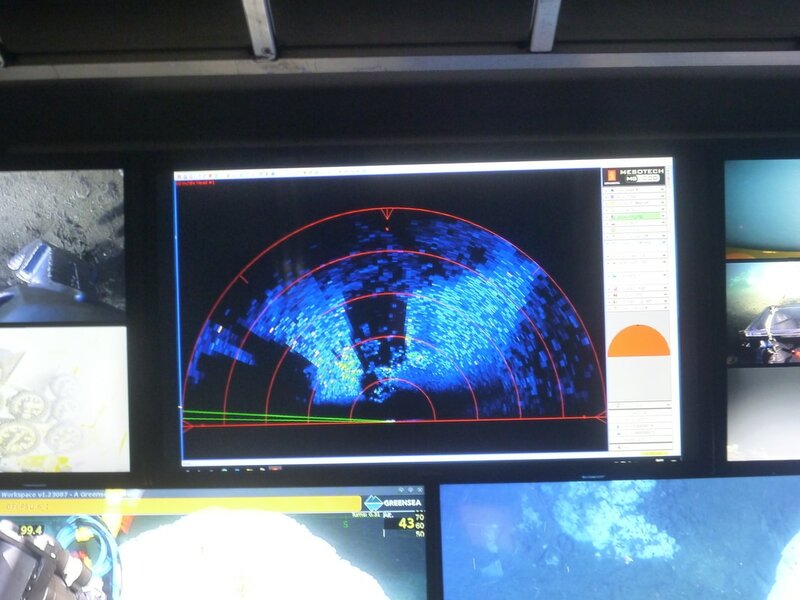 The instruments recorded the data flawlessly (not always the case). ​We placed the flow and oxygen probes in the osculum of a Farrea occa and left them to record over a day and a half. The final graph shows flow coming out of the osculum (red) as well as surrounding flow recorded by a thermistor (blue) and Vector (grey). Additionally we recorded oxygen coming out of the sponge and from around the sponge, and calculated the difference as how much oxygen the sponge takes out of the water column (green). We found that the results were very similar to what we got in 2015: the flow out of the sponge increases with the flow surrounding the sponge, but the oxygen removed by the sponge decreases (not obvious in this graph, but clear from another analysis we won't show yet). This means that while the sponge is processing more water, it's actually using less oxygen - and thus energy - to do so. It may be that sponges are so common in the Hecate Strait because they are able to use the tidal cycles (as clearly seen in the graph) to their advantage. We got a comment on Twitter commending Sally on being an inspiring woman in a STEM field; it was very much appreciated. 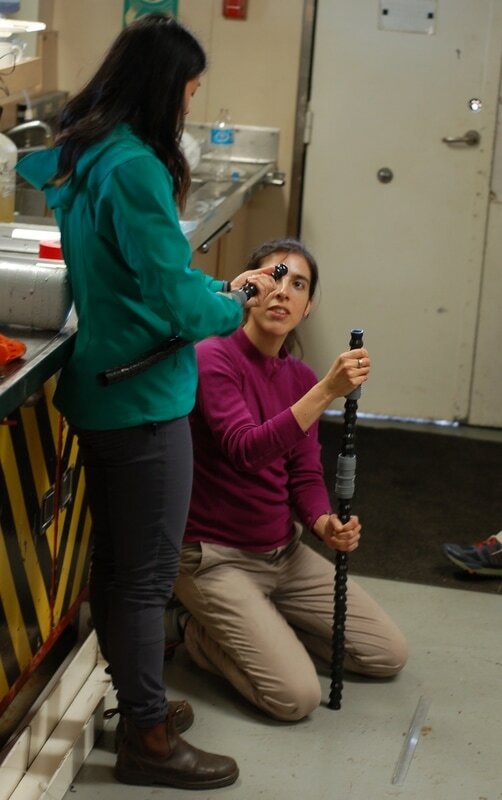 Considering our research crew is 70% women it seems appropriate to talk about being a woman in science. Our female team was asked questions that we thought would be pertinent to aspiring young scientists, and below are some of their answers. What about your field in science do you find exciting? "The deep sea is one of the least studied regions of the world. I love the idea that when we go to a new place, we might find things no one ever knew existed. I also really enjoy everything about our ship cruises. I am happiest when I am out at sea (even though I am notorious for getting seasick very easily). " "​I am a marine ecologist. I find the ocean exciting because it is like outer space. There are parts unseen with new critters waiting to be discovered. As a child, I imagined myself as an astronaut, so deep sea exploration is as close as I will ever get to being in outer space!" "Figuring out how the ocean works and how it is capable of such abundant life. Getting to be out in the field trying to answer that question." What inspired you to pursue science? Do you have any role models that affected your career path? "There are no scientists in my family, but I found biology fascinating because it told who animals were and how they interacted and functioned. When I went to UBC I took invertebrate biology from Tom Carefoot and Sandra Millen; I was blown away by the kaleidoscope of creatures that lack backbones (invertebrates). They were my first science mentors and instrumental in fostering the idea that marine science could be fun." "In terms of role models, my mom is a fantastic role model for perseverance. She’d call it stubbornness, but she says that once she puts effort into something, she doesn’t want that effort to be wasted, and that really taught me follow-through. She also says that it doesn’t hurt to ask for something because the worst that someone can say is “no.” That’s worked out very well for me." Were there moments you felt your gender affected your reputation/perception? How do you overcome this challenge? "Yes, in too many situations to relate here. There are so many biases against women in science, both conscious and unconscious. The only way to overcome this is to be open about it, find constructive ways to talk about biases people may have, and training more women in science." "Maybe not reputation, but it affects some aspects of work life. This is changing though. "I think there needs to be more flexibility for women to take parental leave from work. I’ve spoken to many female scientists who don’t end up pursuing academia because their “biological clock is ticking”. I think it is a shame we lose perfectly capable and highly intelligent women from science for this reason alone." "I think there are (unfortunately) still too many subtle experiences that cumulatively deter young women from pursuing STEM careers and education. Focusing on challenging these barriers early on may lead to more women in STEM." "Providing more support for women that choose to have families. Promoting more women into leadership roles. Recognizing, talking about, and finding ways to combat unconscious biases." ​Were there times when you were on the brink of giving up science? What made you keep going? 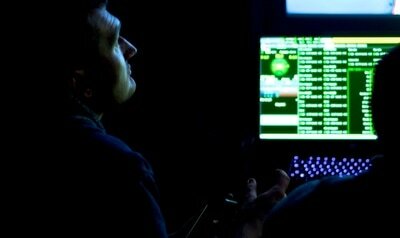 "Yes, I wondered after my postdocs whether I should go into teaching or medicine or editing. But, in the end I just couldn’t stomach giving up the freedom to have a job that allowed me to follow my curiosity." "The ratio in the number of specialized research jobs to the number of qualified candidates is small so there’s a lot of competition. While I have not thought of giving up science, I have considered taking research work in fields more tangential to my field of expertise – these were jobs I considered holding while I continued to search for a position that was more aligned with my expertise and interests. It definitely takes perseverance, luck in timing for finding available opportunities, mobility and circumstance." "While I was working on my PhD I worked as a science translator at night and yet I could barely make ends meet. At one point, I wondered whether I should become a full-time translator instead. I kept going because of the strong sense that there was more for me to do in science- and that I could do it." Do you think you have specific characteristics that allowed you to persevere in science? "Curiosity, creativity, perseverance, open mindedness, an ability to work independently and with others, and an ability to learn new things are some characteristics that have been helpful." Do you have advice for young girls aspiring to go into your field of science? "If you go into a profession or field that you’re passionate about and inspired by it will be easier to put in the hard work that will be required to make a path for yourself. I think this applies to many fields/careers – not just in science." So, what is a sponge anyway? Is it a plant? Is it a coral? These are common questions I get asked by my non-biologist friends. In fact, sponges are animals in the phylum Porifera. Corals (also animals) are in the phylum Cnidaria along with jellyfish and anemones. Sponges are superficially quite simple and thought to be one of the first multicellular organisms to have evolved. But, as with most things, there is complexity within their perceived simplicity. Scanning Electron Microscopy photo of the inside of a sponge. Fluorescein is a non-toxic compound used to visualized flow. 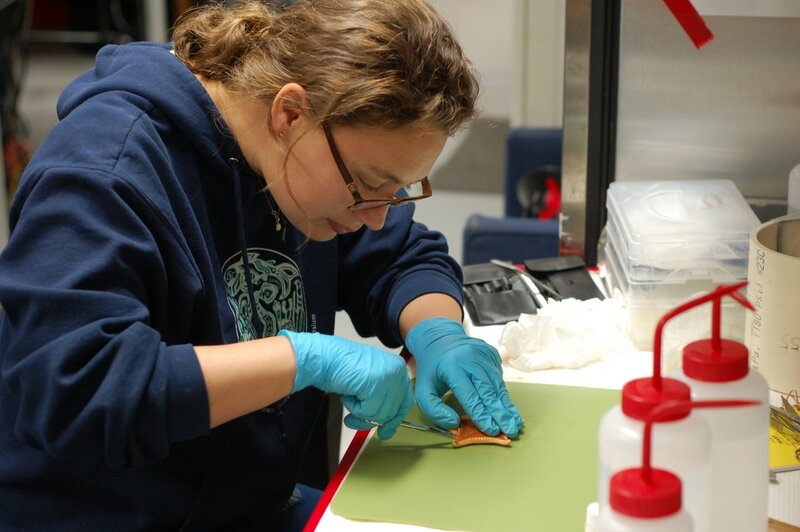 About 90% of species are Cellular Sponges (demosponges), but we're at the Hecate Strait studying Glass Sponges.​ Glass sponges are named for the silica skeletons they grow, silica being the main component of glass. The skeletons are rigid and allow the body to stay upright, which is important so that sponges get exposed to surrounding flow which alleviates the amount of energy needed for them to pump. ​But the true distinguishing feature of Glass Sponges is that they don’t have membranes separating the cellular brain (the nucleus, for the more biologically savvy), making them essentially one large cell with various compartments. This allows a fast action potential – electrical signal like neuronal signalling– to be passed throughout the tissue and cause pumping to arrest. 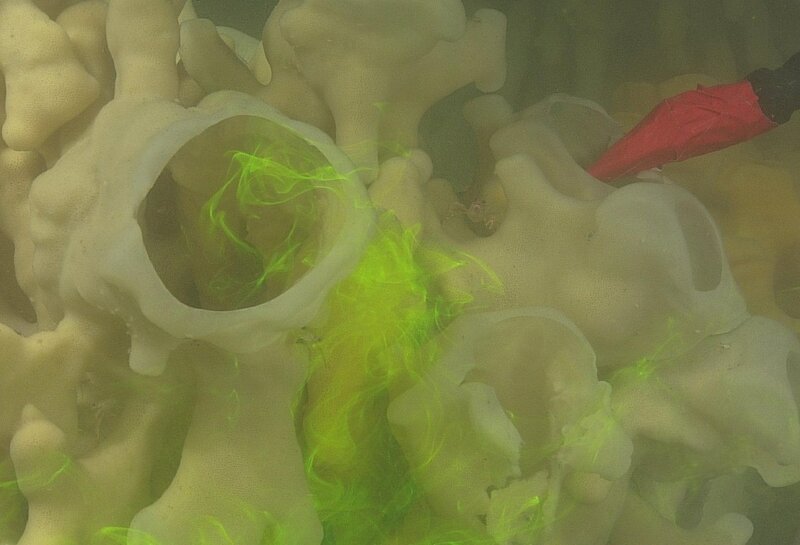 From lab experiments we know that if there is too much sediment in the water the sponge will stop pumping to avoid clogging its pores; this is a large reason why bottom trawling is so destructive to sponges. One of the goals from this research cruise is to determine the effect that sediment has on glass sponges right on the reefs. Glass sponges with their oscula at the top. A picture of a demosponge Sally took at the Smithsonian Tropical Research Institute in Panama. 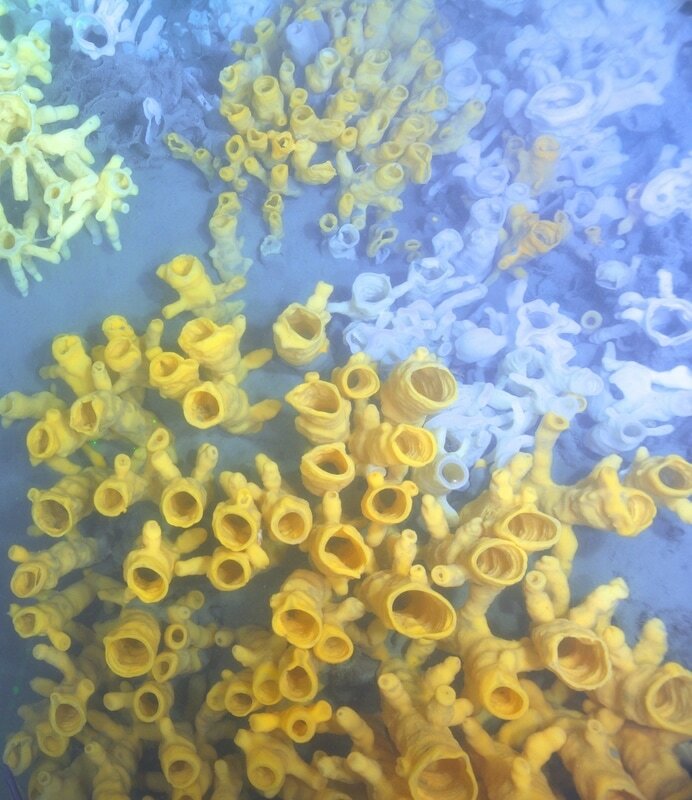 ​Unlike glass sponges, cellular sponges do have membranes separating individual cells. This means that an action potential can’t be quickly transmitted through the body. Instead they rely on molecules to transfer the signal, but the exact mechanism isn't yet known. Cellular sponges also evolved a way to get rid of sediment. 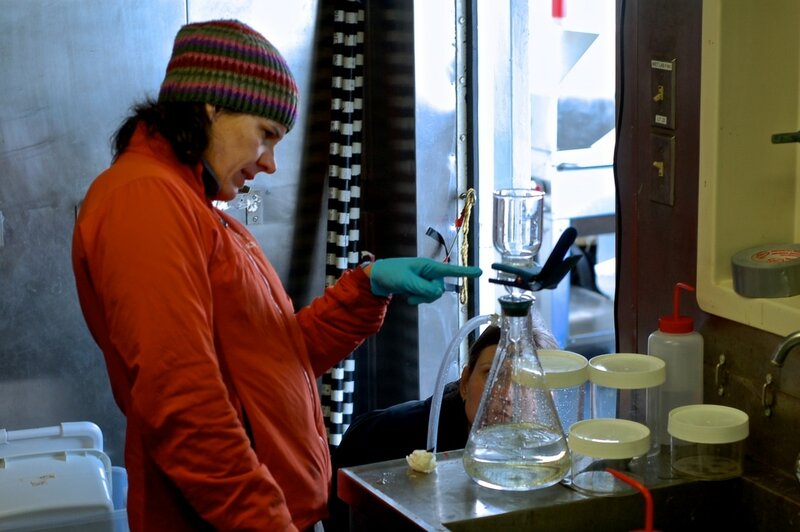 Instead of arresting their pumping, they “sneeze” out the sediment with rhythmic contractions. 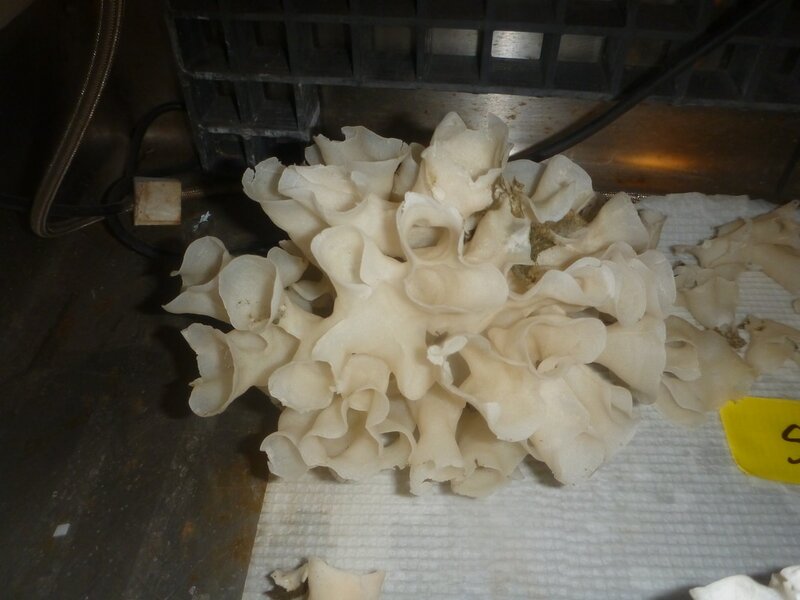 ​Sponges are interesting to research from many different angles. Evolutionarily, they represent a very important transformation from a (presumably) colonial unicellular animal to a single multicellular animal. Ecologically, they provide structure for other animals to live in and around, and change the water composition around them by filtering out bacteria and excreting nitrogen and poop. Additionally, sponges are one of the most used marine organisms for finding natural sources of metabolites that can be used in medicine. 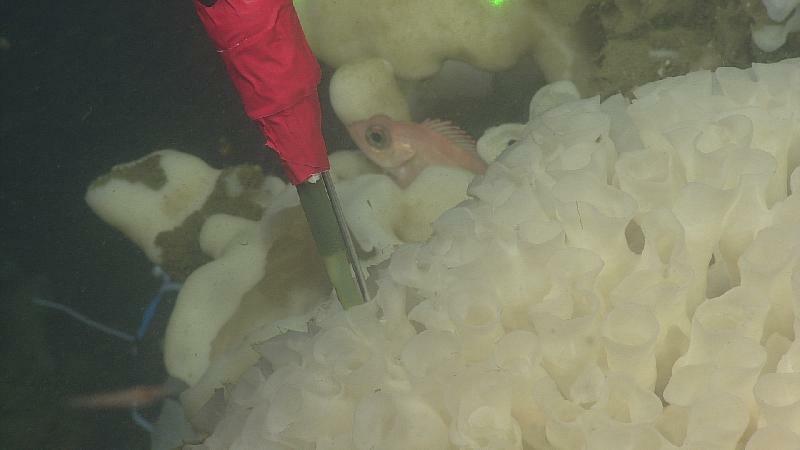 Now that you know a little about sponges, read specifically why we’re doing our research in the Hecate Strait in the "What is the purpose of this cruise?" blog below! 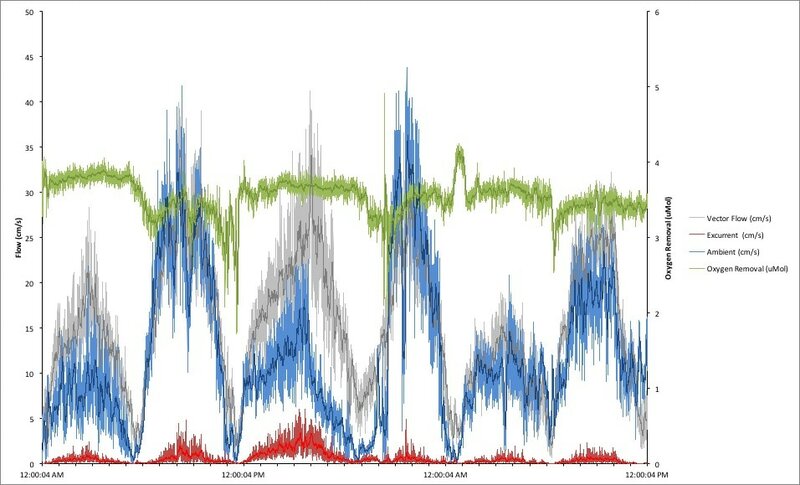 What does 'thermistor' flow sensor data look like? We checked the data from one of the flow sensors to check that it was in range. This picture shows a the flow just over the bottom. 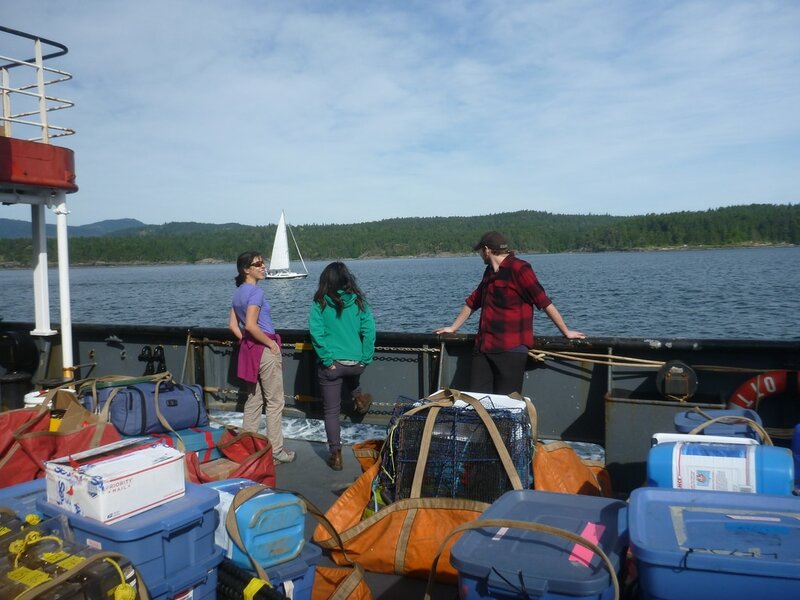 Now we will bring the instruments up and do the calibration on deck and send them down for the sediment experiment. 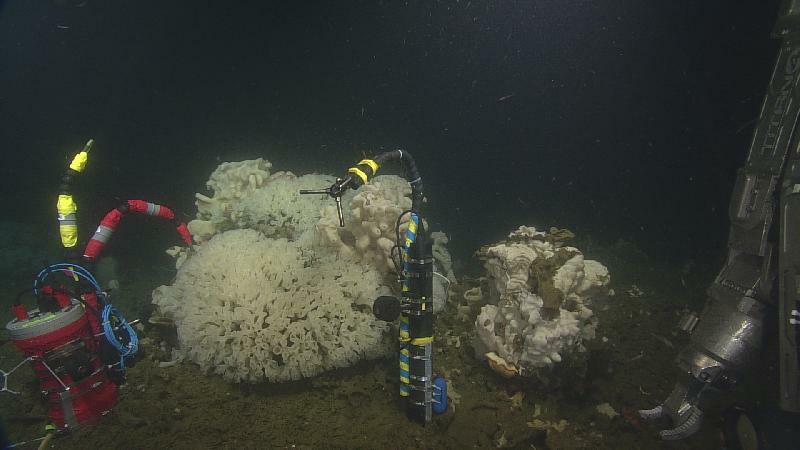 The Leys lab has been exploring the sponge reefs off the coast of British Columbia. 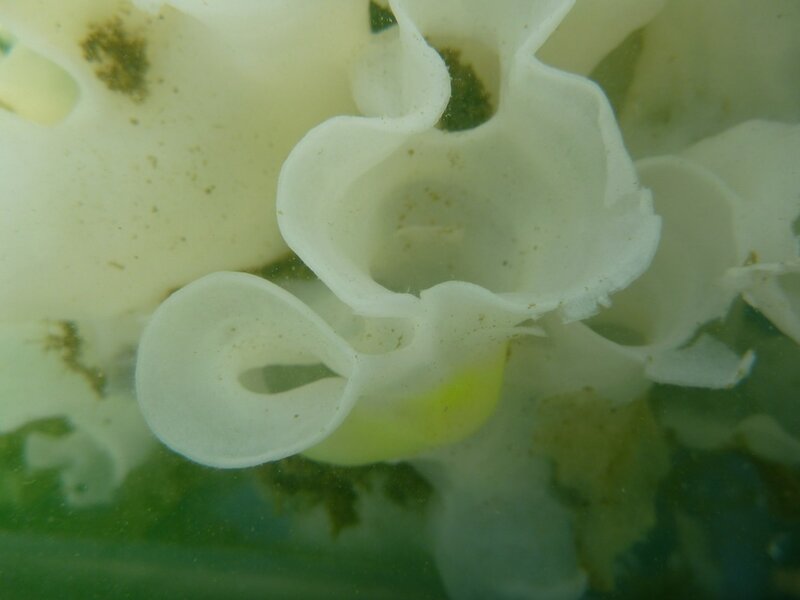 Using the Remotely Operated Vehicle ROPOS our team has been studying the ecology, physiology and behaviour of sponges in the newest Marine Protected Area in Canada. Check in with us on our LIVE Stream!